I recently learnt that you can even catch a bug or other illness without even leaving the house. My daughter went to a party and came home with a stomach bug for me, that one of the other kids had. Even though she resisted the germs they were carried by her, onto me! I now insist ( ESP as I have a 7 month old baby) that she washes her hands with tea tree soap. 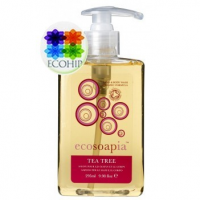 We use Ecosoapia Tea Tree hand and body wash. It’s great and I feel that everyone is clean and safe afterwards. I’ve also been told you need to wash your hands for 15-20 seconds to get them really clean, but if you’re worried about wasting water do them quickly but thoroughly! Another way I’m avoiding the ‘germs’ that are continually going around the school, is changing my daughters clothes as soon as she comes home. She insists on jumping into her brothers cot so the condition is simple – get your uniform off. I then throw it into the washing machine with an Aquaball (www.ecohip.co.uk) and everyone’s happy. One can become obsessed but prevention is easier than sick kids or adults! I’m sure you’ve heard about the supermarket trolley being the most germ ridden thing of all? So before unpacking the food remember to wash your hands and especially the child who has sat in the trolley. Isn’t it ironic that the Dr’s surgery is the worst place to catch germs as everyone is there because they’re Ill. I try and avoid the place unless it’s really necessary but remember to avoid flicking through the magazines that other sick people have been touching and don’t let your kids play with the toys. The waiting room is a tricky place. Click on product to have more informations ! I was bored but thank to your blog I am happy ! You know that your website is amazing ? sure whether this post is written by him as nobody else knolw such detailed about my problem. I simply want to say I am just all new to blogging and actually liked your web-site. Probably I’m want to bookmark your blog . You actually come with awesome articles and reviews. Bless you for revealing your blog site. Next Next post: Shouldn’t We Know ‘Exactly’ What Are Kids Are Eating?